How to Choose a Holiday Photo Card that you Love! The holidays are a special time of year to reconnect with family and friends near and far. In the US, photo cards have become increasingly popular over the past 10 years. Even with social media and pics posted daily, the tradition of holiday cards remains strong. The design of the card is the most important key to consider. You have a great photo so make sure the card highlights your photo. The design of the card should complement the pic and not be the focal point. I have received cards where the photo was inserted into a box on the card and the photo was not sized correctly, so the people are unrecognizable. Again, choose a card that makes your photo look the best it can be. 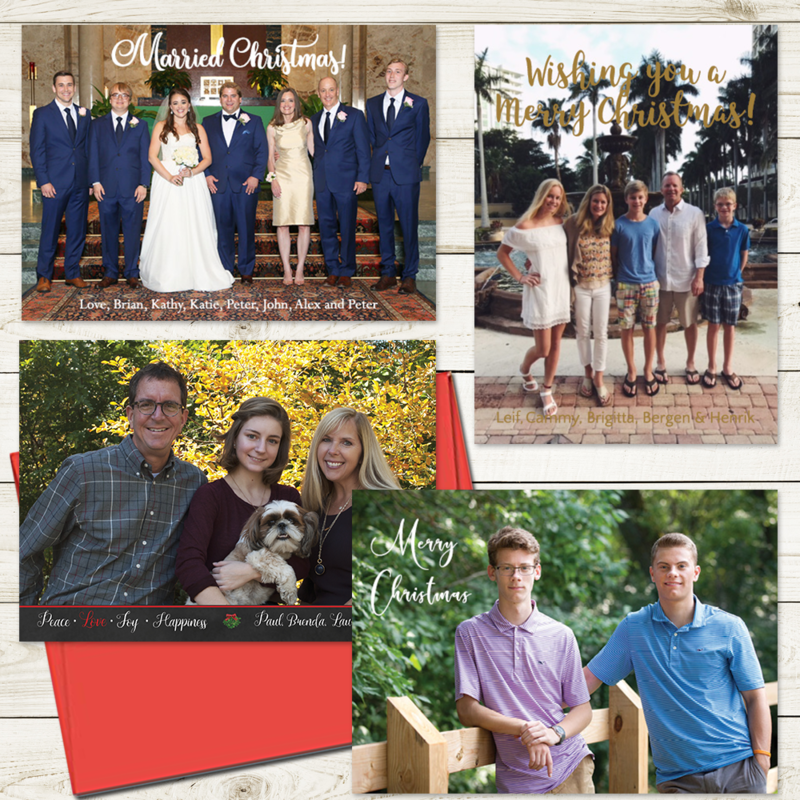 Holiday cards can be purchased from local designers or websites each offering their unique designs. A great reason to Buy Local is that a local designer will let you know if anyone else in your area has purchased the card to avoid duplicates. A good designer won’t sell the same design to two friends. The Card Stock -The heavier the better. Photo cards should be printed on 100lb or heavier stock. Choose matte, shimmer, die cut edges, flat, fold-over; the options are endless but the most important is choosing a nice heavyweight stock. Determine which type of printer is used by your designer. There is a huge difference. Choose a designer that has the card printed on a professional grade printer, not a home ink jet printer. The photo should be at set to at least 300dpi. Save as a jpg or png file. Your designer will have specific requirements but a good start is to have the highest resolution photo possible. Are there quantity discounts? Usually orders over 50 cards will receive a quantity discount. What is the turnaround time? Usually 3—5 business days – the earlier you order, the better. Are there special offers for ordering early? These are just a few suggestions to consider when choosing where to purchase your holiday card from. At Lafayette Papers, our goal is to create a card that highlights your photos with a festive design printed on high quality card stocks. Each card is unique to the customer. How does Lafayette Papers answer the criteria above? 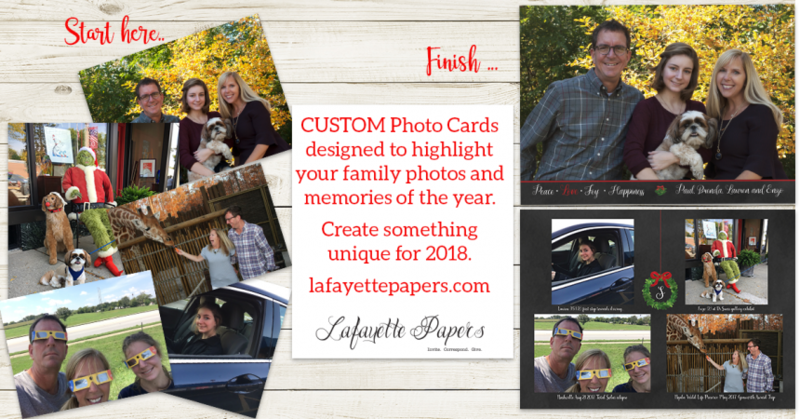 Custom Photo Cards from Lafayette Papers. Lafayette Papers will design your card after we receive your photos. We design to highlight your photo and the card design enhances your photos even more. No two cards are alike. We print on a 110lb smooth white or a 120lb eggshell. Both are heavy weight stocks. We also offer metallic stocks and a large assortment of colored envelopes. Envelopes can also be designed to complement the card. Our cards are printed by a STATIONERY fulfillment company on a HP Indigo Press. ALL they do is print stationery. I love the quality of their products. The photo should be at set to at least 300dpi. Save as a jpg or png file. The higher resolution, the better. Turnaround time? Usually 3—5 business days – the earlier you order, the better. Contact us to send us your pics and start designing. Custom Holiday Photo Cards designed to highlight Your photos!